Collect new memories, have unforgettable adventures and go where the locals go — it's all possible in Navi Mumbai. But first, let us fill you in on a few basic facts about your next vacation destination! Navi Mumbai is a neighborhood in the well-loved city of Mumbai. To get there, travel 12 miles (19 kilometers) southeast of the center of town. Travelers to Mumbai will be rubbing shoulders with around 12,700,000 residents. If you're arranging an escape to Navi Mumbai, you'll want to listen up! It's possible to save heaps by locking in a Travelocity airfare and accommodation package deal. Simply select from upwards of 400 partner airlines and 665,000 lodging options. Way too many choices? We'll make it simple! Our Customer 1st Guarantee gives you the added comfort of 24/7 personal assistance on everything from airfares and accommodations to activities and rental cars. If you somehow chance upon an even better bargain elsewhere, we'll refund the difference^. You can never predict if a circumstance will change. However, when you book a package, we guarantee no cancellation fees from us. And so long as you get in fast, many accommodations won't charge you either^. If you have your heart set on staying close to the center of Navi Mumbai, Travelocity has what you're looking for. With that said, we only have 8 listed properties, so it's a good idea to book ahead. Choose the best room and then start organizing the fun stuff! Explore the deals on offer at the Hotel Grande 51 (Thapar Complex, Plot No.51, Sector 15) and the Hotel Aishwarya Residency (Plot no- 34/B, Sector 23 , Nerul, Darave). They're our recommendations. Where do you fly into for Navi Mumbai? Put your seat in the upright position, stow your tray table and get ready to land at Chhatrapati Shivaji International Airport (BOM). This is the closest major terminal and it's approximately 12 miles (19 kilometers) to the northwest from the center of Navi Mumbai. Collect your luggage and let the fun begin! Can I rent a car in Navi Mumbai? Getting off the beaten track is an excellent way to discover a new place. So, why don't you do it from behind a steering wheel? Book a rental car via Travelocity and get set to crank up the music in Navi Mumbai. Collect a vehicle from the Chhatrapati Shivaji International Airport area and ensure the only taxiing you'll be doing is from the tarmac to the arrivals gate. Make your way to Hertz, one of the best outlets here. Get back in touch with your inner child with a wild and wonderful day out at Wonder Park! Food, fun and tons of rides — get set for a good time! Want some more close by options? Constructed to pay homage to the gods, temples offer an interesting look into another religion and culture. Learn about the local belief system and step into the beautiful sanctuary of Nerul Balaji Temple. But that's not all. Even on a wet day, it's worthwhile taking a walk through Belapur Mango Garden. Just put up your umbrella and breathe in the fresh earthy smell. Belapur Central Business District and Belapur are well worth visiting while you are here. Belapur Central Business District is about 1 mile (2 kilometers) away, and Belapur is 1 mile (2 kilometers) away. Located in the heart of Navi Mumbai, this hotel is 1.6 mi (2.5 km) from Kharghar Hills and 2.3 mi (3.7 km) from CIDCO Exhibition Centre. Inorbit Mall and DY Patil Stadium are also within 3 mi (5 km). Navi Mumbai Turbhe Station is 13 minutes by foot and Navi Mumbai Juinagar Station is 22 minutes. 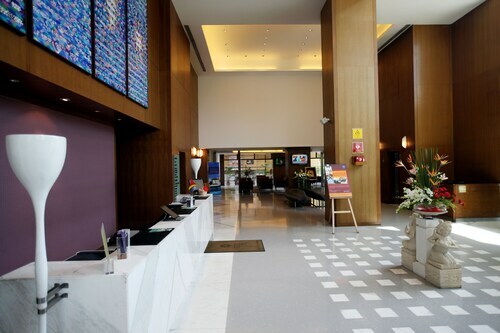 This family-friendly Navi Mumbai hotel is located in the business district, within a 15-minute walk of Inorbit Mall and CIDCO Exhibition Centre. DY Patil Stadium and Wonder Park are also within 6 mi (10 km). Navi Mumbai Vashi Station is 8 minutes by foot. 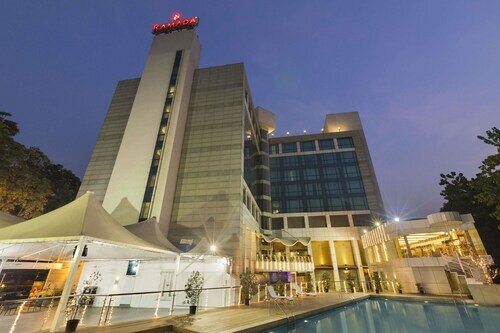 This family-friendly Navi Mumbai hotel is located in the business district, within a 15-minute walk of Inorbit Mall and CIDCO Exhibition Centre. Seawoods Grand Central and Kharghar Hills are also within 6 mi (10 km). Navi Mumbai Vashi Station is 8 minutes by foot. This family-friendly Navi Mumbai hotel is located in the business district, within 1 mi (2 km) of Kharghar Hills and Belapur Mango Garden. Seawoods Grand Central and Wonder Park are also within 3 mi (5 km). 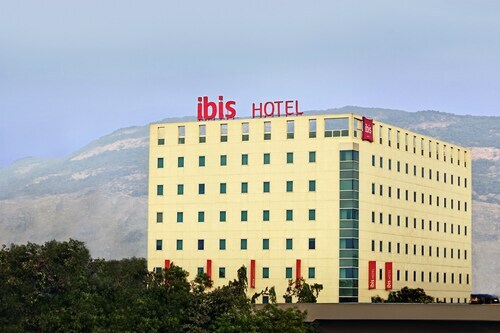 Located in Vashi, this hotel is 1.8 mi (2.9 km) from Inorbit Mall and 1.9 mi (3.1 km) from CIDCO Exhibition Centre. Reliance Corporate Park is 2.6 mi (4.2 km) away. Located in Kharghar, this luxury hotel is within 1 mi (2 km) of Utsav Chowk, Kharghar Valley Golf Course, and Kharghar Hills. Belapur Mango Garden is 2.7 mi (4.3 km) away. Navi Mumbai Kharghar Station is 12 minutes by foot. Located in Kopar Khairane, this hotel is 0.4 mi (0.6 km) from Reliance Corporate Park and within 3 mi (5 km) of Kharghar Hills and Dhirubhai Ambani Life Science Centre. CIDCO Exhibition Centre and Inorbit Mall are also within 6 mi (10 km). Navi Mumbai Ghansoli Station is 23 minutes by foot. This family-friendly Navi Mumbai hotel is located in the entertainment district, within 3 mi (5 km) of Inorbit Mall and CIDCO Exhibition Centre. DY Patil Stadium is 4.6 mi (7.4 km) away.